I begin to capture food in the nature for my aquarium fishes about 1968/69. First I found black mosquito larva and this is the best food I can give my fishes. They loving it and gives the best nourishment to the fishes. Every year I give them this from ending April to normally June, but some year it is possible to find mosquito larva to the ending of September. 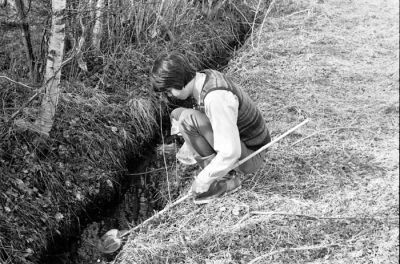 These two pictures are from the spring 1971 when my friend Erling (in the photo) and I was looking for black mosquito larva in heath land close to where we was living. This was early in the spring and the snow had not melt in the forest, so it was too early to looking there. But we found some in the pounds we were visiting. 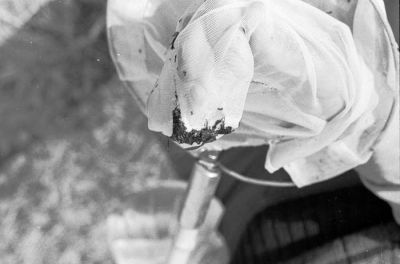 As you seeing in the picture is only a bucket or plastic bag and fine-meshed net you need for catching all type of water insect and larva as food for your aquarium fishes. Some toyshops is selling fine-meshed net for about 5 to 6$. The only you have to done is to get experience in finding ponds and meltings water ponds where this water insect and larva is living. How I doing that, that you say? You can start with walk in to the nature and try your fine-meshed net in the ponds you found. May be you are lucky and finding food animals at once. 1. AVOID PONDS WITH FISHES, THEY OFTEN CARRING PARASITIC HOW CAN BE VERY HAZARDOUS FOR YOUR FISHES. IF YOU ARE FINDING FOOD ANIMALS IN A POND YOU ARE NOT SURE ABOUT IS FREE FROM FISHES, FREEZING THE ANIMAL BEFORE YOU GIVING THEM TO YOUR FISHES. 2. ALWAYS USE FILTER TO SEPARATE THE FOOD ANIMALS IN SIZE AND RINSE THEM CARFULY UNDER WATER BEFORE GIVING THE FOOD ANIMALS TO YOUR FISHES. Good luck with catching food in the nature. Today, there have been 35157 visitors (90849 hits) on this page!